Let Me Go On &; On...: The Loss of Life: Is There a "Plan"? Can you just imagine being a pregnant woman and deciding to take a beautiful stroll into the park because it was absolutely gorgeous outside? You decide to sit on a bench to rest and daydream about your future - to daydream about what your son or daughter will grow up to be or how you will raise him or her. Your thoughts are endless as the sun glistens down, shining through the trees making little golden circles around your feet. It's the perfect day. Perfect, until the 200 year old oak tree falls on top of you, crushing every bit of life you have left. 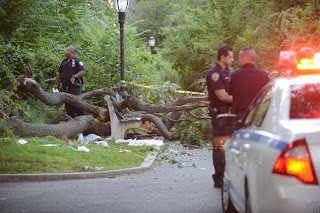 This is what happened to a Queens woman the other day. The first 'fall-like' day and she decided to sit on a bench in the park. What makes someone come at the right place at the right time like that? Is it "right"? Is it God's plan? Stuff like that makes me wonder if it was all meant to be --- as if it was planned by God Himself. "Well, why would God do such a terrible thing like that?" Was it "terrible" in the overall big picture? Maybe it was her time? It makes people start wondering about their own fate and whereabouts: are they safe? Will they encounter a tragedy on their way home? Will they make it home alive? I guess you can compare instances like these to drive by shootings or some random killing spree -- an unexpected death that just takes us by surprise. There are no explanations, reasonings or logic behind it. It. just. happened. Do you lose your faith in God or does it get stronger? If you're atheist, does it make you think that God really does exist, or does this definitely confirm that there can't possibly be a "god" at all? You can spew out every cliche known to man. "Well it was meant to happen ," "Nobody knows when your time is up," -- all comforting in some twisted way. At the animal hospital, this guy carried in his lifeless bull dog. He ran up to the counter and screamed, "I think my dog is dead! I found him on the bed this way! Please help me!" For whatever reason the dog died, it wasn't supposed to happen - well at least not now while the dog was fairly young. When we lose a pet, we have to think, 'why' too. Why are their little lives cut so short and ours so long? 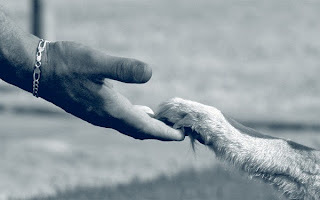 I do believe that when a pet goes before their time, they were definitely meant to be in your life at the most important time. Pets give comfort. So when you can think back of when a pet died suddenly and way too soon for you to possibly fathom, think about what kind of trials you were going through when you got the animal at first. I know this sounds all cooky - but I truly believe pets come into our lives for a reason, and when their mission is done (just like humans) they leave this planet in whatever way is planned for them. And if we're lucky enough, they live to the fullest extend of that breeds longevity. I know that without a doubt, my dog was a blessing. I didn't really want one - I was browsing around the rescue sites and saw this little scrawny dog - as if her eyes were begging me to take her home. My father was really ill at the time and her companionship after all the grueling hours at the hospital made it all worthwhile, or at least comforting. I cried while Lola would lick the tears falling off my face. She even comforted Dad when I brought her over to him. She still comforts me every single day. People who know me (or used to) remember me as someone who was never into pets. I always said, "I will never get a pet. Houses weren't made for them." And now, not only is my home made for Lola, my couch, my blankets and my bed are made for her as well. When I get panic attacks at night, I hold onto her and she cuddles up next to me. I fall asleep instantly. Something's gotta be said for that and why she came into my life so quickly like that --- and during the worst time of my life. So while we say goodbye to a loved one, or a beloved pet, just focus on the happiness and joy they brought to you - whether person or animal. They are all here for a reason. I always ask why God took my Dad so soon, but was it too soon? He was miserable and suffering every single day of his life. It brings me peace to know that he's no longer in pain. He's not screaming in agony and hating every second of his existence. But you have to have the faith to believe that he's in peace - that he's with God and he has eternal life in heaven. Sometimes I wonder is it an eternal hell for those who don't believe...? You can debunk anything you want since it doesn't correlate with science, but if God made science, then wouldn't He have a plan that is foolproof where nobody can tamper with the secret files of life? I believe.